Beneath the Rowan Tree: Can *you* Afford the CPSIA? If you have not heard about the CPSIA~ the new US law that (positively) limits lead and other harmful substances in consumer products, but which (negatively) is making sweeping changes that will wipe small handmade US-based businesses off of the map? Check out the Handmade Toy Alliance for more information. Essentially, this law requires third party testing, certification and serialization of every component that goes into a product for children under 12. The problem, of course, has been plastics and other synthetic materials and large manufacturers~ no one would like to see them continue to produce dangerous items unchecked, but the small toymakers, and seamstresses etc. who use natural materials are also getting slammed. And the irony? While home based US businesses are having to close up, the big guys are producing questionable (and ugly!) 'eco' and organic items because they have the cashflow to do it. If you are an American, please take some time to get the information, contact your delgates and make your voice heard. So many toymakers have chosen to make safe and healthy alternatives to what is available on the commercial market, only to have them outlawed *because* of the flaws in the commercial market. As a Canadian based business, with the exception of wholesale into the US, my business will remain unchanged, but I cannot help but spread the word and need for action for my US based colleagues and friends. 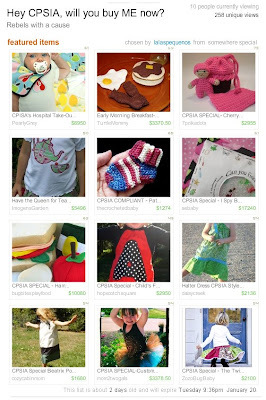 Some clever folks on Etsy have calculated the costs for their handmade items under their new law, as displayed in this Treasury. Its true. Whats the real price of CPSIA law for children's toys. It's simply out of line and crazy. I just don't know how any business big or small can stand through this. I heard KB toys in our town went out of business..I wonder if this has anything to do with it. OMG! So if your only ingredient is wool, you need to have it "tested" by a third party? That's ridiculous! Can't they have a "buy at your own risk" clause for smaller home-run businesses? If it is dyed wool, yes, it must be tested, and each different dye colour, at that.